We can see you at home or at work, day or evening. ​We offer a full face to face service to set your lasting powers of attorney up properly. 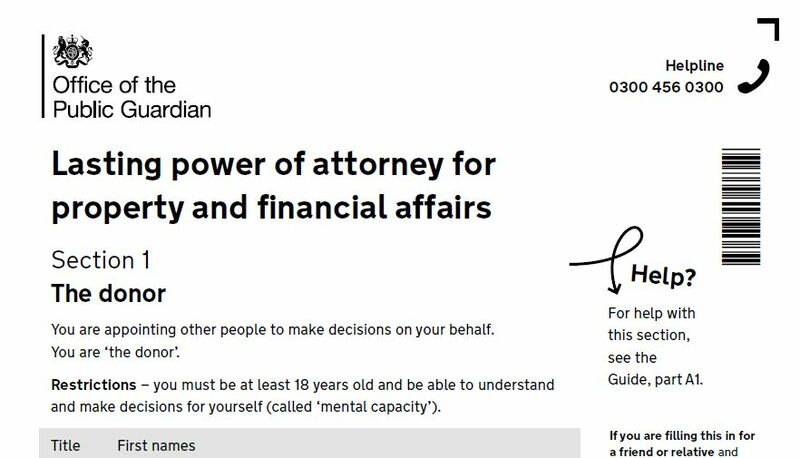 A lasting power of attorney is a very important document. Many people see them as a tool to help elderly relatives, but they are vital for anyone whose family will suffer financially should they become incapacitated through illness or accident. With one, almost every financial situation can be catered for. Without one and your finances could be frozen until a much more expensive path is taken to arrange for a suitable person to look after your affairs. It is a common misconception that joint bank accounts can be used while one person has lost capacity - this is not the case and even joint bank accounts can be frozen by the bank until capacity is regained or an attorney is created. If capacity is lost before an LPA is created, the cost and issues rise dramatically. LPAs need careful completion or else they will be returned with a further submission fee required. Although they can be completed with time and effort, it is the options to include that should be most seriously considered. Should you appoint attorneys jointly, or jointly and severally; what restrictions should you have in place to ensure your finances are protected; should you give immediate power, or delay them until a specified event? We can answer all these questions, and guide you through the common pitfalls, as well as seeing through the whole process until completion. There are two types of LPA - a property and financial affairs version and a health and welfare version. We charge £300 for one LPA, or £500 for both for one person. If a couple take both the cost will be £800 for all four. There are also court fees per LPA of £82 per document, but if your income is below £12,000 or you receive income related benefits, then the court fees will either be reduced by half or reduced to £0. We offer great value, and are backed by the IPW indemnity insurance scheme, so the advice and service is guaranteed. We also offer FREE ongoing advice and help for you and your attorneys. ​Pricing is subject to vat. but vat is not applicable to court fees. We only give face to face advice because of the nature of a Lasting Power of Attorney. As your certificate provider we measure your ability to make the LPA in the first place. This will mean any challenge in the future or other issue can be dealt with, such as your ability to appoint certain attorneys. As an IPW member, we have been professionally trained and have the backing of professional indemnity insurance. We are trained to draft and register your LPA as well as providing on going support and guidance at no cost. We have advised and helped clients with LPA issues for many years. Call us on 0800 3 345 245 for more information! Calls to 0800 numbers are part of your inclusive minutes for mobile phones so should be at no cost.